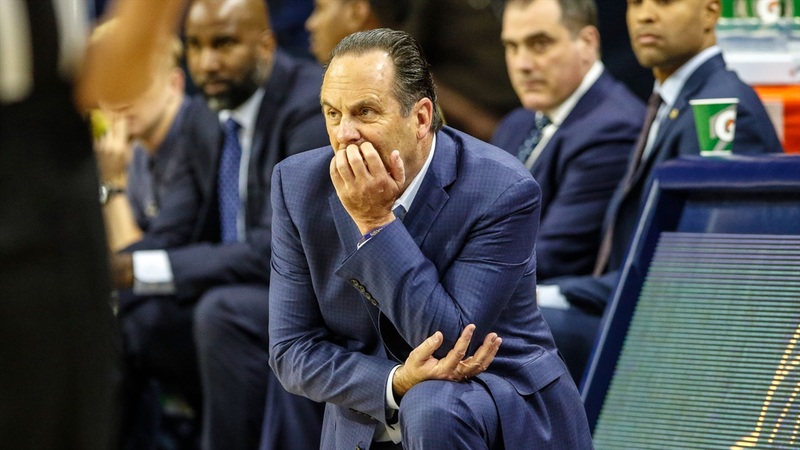 Notre Dame head coach Mike Brey showed some frustration for the first time all season as the Irish fell 77-73 to No. 17 NC State on Saturday afternoon at Purcell Pavilion. “Anybody can take the shot when there are 15 minutes left or in the first half. Sometimes guys are a little nervous. I thought that happened against UCLA. We didn’t know who to really go to, but we’ve been going into John (Mooney). “He’s really tired. That’s why we have to play Chris Doherty right now. We just can’t play this league schedule with seven guys not knowing (Juwan) Durham’s situation. I’m really guarded. I don’t know if Mooney will practice the next two days. We have to be careful I am concerned about it. “He gave us good minutes and he’s a warrior. I could care less about redshirts. That can be a little overrated. You can always redshirt a guy. We need to have him ready. He’ll play on Tuesday and the rest of the way. “It's been very frustrating for me not to be able to find a consistent offensive rhythm. We have some skilled offensive guys out there and getting looks. We just haven't been able to do it. It just puts so much pressure on your defense. “Getting into the 70s, we should have a parade. We’ve been locked in the 60s. We got to 73, but against a team like that, we have to get 80 at home. It’s frustrating and we have to figure out how to help them. “He’s been great. I feel for him. He tried to make some plays. The three he had - those are the threes he’s made the last two games. He’s had a hard time finishing, but he’s learning there are some athletic dudes back there. If he can turn a corner and get to the rim, he’s got to go. “We play a good team who is hard to score on and we have a hard time scoring. That’s a bad recipe right now. They don’t score it a lot, but they guard you. We’re going to have to make some threes over the top because they have a shot blocker.